What is Shen Min Hair Regrowth Original Formula? Shen Min Hair Regrowth Original Formula Hair Nutrient is the product which we will be looking at in this particular review, to better acquaint you with its benefits and possible drawbacks. The product is specifically designed in a way so that your hair may become strong once more as to prevent hair loss, and the use of this product also ensures that your hair grows more rapidly. Shen Min Hair Regrowth Original Formula Hair Nutrient is a natural hair nutrient product which has been the basis of traditional hair treatment for several centuries in the east, and has been blended with western technology to get the best of both worlds. 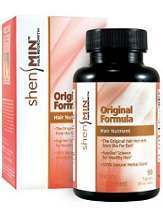 But does Shen Min Hair Regrowth Original Formula Hair Nutrient succeed in this endeavor? Shen Min Hair Regrowth Original Formula Hair Nutrient is composed of special ingredients, including a number of unique herb extracts which have been a cornerstone of eastern traditional hair loss treatment for centuries. It is complemented by some modern medical research in order to ensure efficacy, and to guarantee an increased rate of hair growth and reinforced follicles. The blend intends to make your hair resistant to the elements and to allow it to retain its aesthetically pleasing qualities. The recommended daily dosage of Shen Min Hair Regrowth Original Formula Hair Nutrient for adults, as suggested by the manufacturer, is 3 tablets, each taken with a meal in order to better facilitate absorption. One package of Shen Min Hair Regrowth Original Formula Hair Nutrient contains 90 pills, which is a supply sufficient for proper use for a month. Shen Min Hair Regrowth Original Formula Hair Nutrient can be purchased from the manufacturer’s website, where one package costs $32.49, making this an averagely priced product. Due to the high concentration of plant extracts, be careful of acute allergic reactions. Always consult with a doctor before adding a supplement to your regimen. The manufacturer’s website is devoid of any information regarding any kind of guarantee policy, nor does the page contain customer reviews. While Shen Min Hair Regrowth Original Formula Hair Nutrient has a long history as a traditional remedy, backed up by a fair price, the product itself unfortunately does not bring the desired results, runs high risk of a nasty allergic reaction, and the customer isn’t insured by any guarantee. As a result, we’d recommend that potential consumers keep looking for a suitable hair loss supplement.